Lactose intolerance occurs when your body has a problem digesting lactose, which is the sugar found in many dairy products. When you're lactose-intolerant, you may experience gas, bloating, diarrhea, or other digestive issues after enjoying dairy products such as milk, ice cream, yogurt, and some cheese. This is a fairly common condition, and fortunately, it's fairly easy to treat. It's possible to avoid symptoms by limiting the foods you eat that contain lactose, and possibly by using an over-the-counter supplement that helps you digest lactose better. 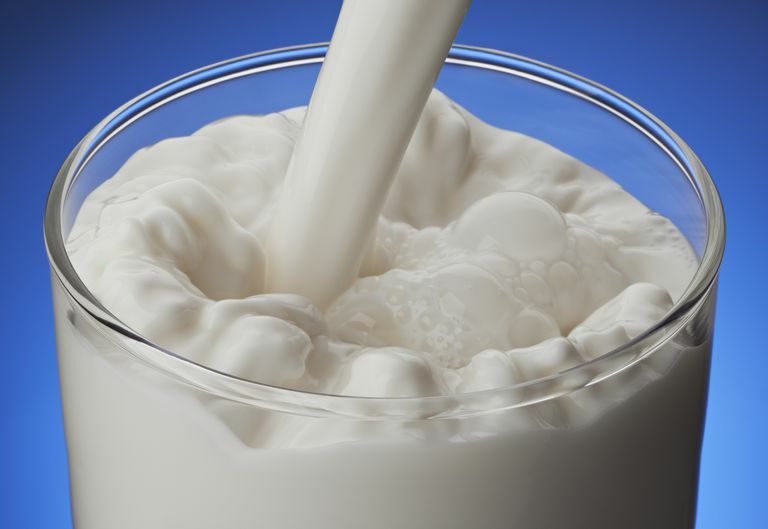 Milk, and dairy products made with milk, generally contain lactose, a type of sugar found in milk. Lactose intolerance means your body can't digest lactose because it doesn't have enough of a particular enzyme called lactase that is needed for that process. The most common is that the lactase enzyme present in your body from birth decreases over time as you get older. This is a condition known in medical circles as "lactase non-persistence," which means that the amount of lactase enzyme your body produces declines over time, potentially leading to problems digesting lactose. Lactose intolerance also may be caused by another digestive disorder, such as Crohn's disease or celiac disease. These disorders can damage the cells in your digestive tract that actually produce the lactase. Once you're diagnosed and treated for the digestive disorder, you may recover the ability to tolerate lactose. Avoiding dairy products for a short time after a gastrointestinal illness may be a good idea. The third cause of lactose intolerance is hereditary and appears from birth. It can result in infants being unable to digest breast milk and requiring lactose-free formula. Symptoms of lactose intolerance are primarily gastrointestinal and may include cramping, gas, bloating, nausea, or diarrhea. Most of the time, these symptoms occur between half an hour to a few hours after eating dairy products. Many people self-diagnose their lactose intolerance, and in some of these cases, they may be mistaken. If you experience symptoms that seem to indicate lactose intolerance and you're concerned, it is best to speak with your doctor to get a formal diagnosis and advice that is tailored specifically to your health and medical needs. Lactose intolerance can be diagnosed by a variety of tests. These include a fasting blood test, a breath test that measures byproducts of lactose digestion, or a test that measures undigested lactose in stool. The stool test is often used for infants. Elimination diets may also be useful in addition to these tests for diagnosing lactose intolerance. Treatment for lactose intolerance consists of either supplementing the body's supply of lactase enzyme, or avoiding lactose-containing foods. Many dairy products contain high levels of lactose. These include milk, fresh cream, butter, ice cream, cream cheese, and cottage cheese. If you're lactose-intolerant, you'll likely experience symptoms when you eat these foods. Fermented dairy products, however, are lower in lactose, and you may find you tolerate them better. That's because they're produced by allowing bacteria to convert some or all of the lactose in milk into lactic acid. Fermented dairy products include yogurt, kefir, sour cream, buttermilk, and crème fraîche. Hard cheeses are also made only from milk protein and include little or no lactose sugar. The simplest treatment of lactose intolerance is to avoid dairy products. However, many people find it difficult to live without milk and other dairy products. To help, lactose-free milk and lactose-free ice cream are available. These products contain lactase that breaks down the lactose sugar. In addition, an over-the-counter lactase enzyme supplement is available that can be taken before eating dairy products. Be sure to follow the package directions when taking these. Finally, there is some evidence that probiotics—helpful bacteria that naturally live in the digestive tract—may help alleviate symptoms in some people with lactose intolerance. If your doctor believes that probiotics may be useful, you can either take them in the form of yogurt (if your body tolerates yogurt), or as capsules (typically found in refrigerated sections of health food stores). It's important to note that lactose intolerance is not the same as a milk allergy, which is common in children. A person with a milk allergy should not consume any products containing milk, even if they contain little or no lactose. People with lactose intolerance vary in the amount of lactose they can digest without symptoms. Some can eat small amounts of lactose-containing foods, while others need to avoid dairy products more strictly. Do be aware that dairy products can be found in unexpected products. These include canned tuna, salad dressings, chocolate, and artificial butter flavorings and margarine. If you do need to avoid dairy products entirely, be sure to replace the nutrients found in milk. All of the major nutrients found in milk are widely available in other common foods. He T, et al. Effects of Yogurt and Bifidobacteria Supplementation on the Colonic Microbiota in Lactose-Intolerant Subjects. Journal of Applied Microbiology. 2008;104(2):595-604. National Institute of Diabetes and Digestive and Kidney Diseases. Lactose Intolerance Fact Sheet. Silanikove N, Leitner G, Merin U. The Interrelationships Between Lactose Intolerance and the Modern Dairy Industry: Global Perspectives in Evolutional and Historical Backgrounds. Nutrients. 2015;7(9):7312-7331.